Some of you may remember that I had 4 pomegranates leftover from my dinner-table centrepiece on my birthday dinner. After much deliberation, and a bit of back-and-forth emailing with the hungry and frozen Laura, I decided to do a double-Nigella: her no-churn pomegranate ice-cream (Nigella Express), and the pomegranate jewel cake (Feast). So, I got my dad to buy some cream for the ice-cream, and lots of almond meal and eggs for the cake. However, when I chopped open the pomegranates, I discovered that they had all gone bad! Nooo! That's what I get for being indecisive! I wasn't sure if I should go buy 4 more pomegranates (expensive! ), or abandon the exercise altogether (wasteful). In the end, I decided to keep making the ice-cream, but scrapped plans for the pomegranate jewel cake. The almond meal will keep quite well, you see, but the cream won't. Luckily for me, Dad saved me from a trip to the supermarket and popped across to our neighbour to ask for 3 more pomegranates from his tree. His tree is bounteous! We can see it from our kitchen window, and it's quite beautiful to look at, laden down with red fruit. So, on to the ice-cream. 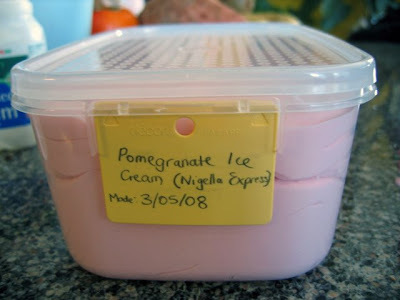 Nigella's no-churn pomegranate ice-cream is made in the same way as her Bitter Orange Ice-cream (Nigella Bites) and her Lemon Ice-Cream (How to Eat). That is to say, you mix fruit juice with sugar, add it to cream and whip until thick and billowing. Then you simply freeze it. No custard-making, no churning. Easy! Juicing the pomegranates can be quite messy, but it's important to make sure you extract every last drop of that precious ruby juice. The recipe also asks for the juice of 1 lime. I didn't have any, so I substituted 2 tablespoons of bottled juice. ... but will need a bit of help with a whisk. When I added the cream, I switched to mechanical whisking. I also have to admit that I added a couple of drops of red food colouring, as the beautiful pink colour of the pomegranate juice was totally washed out by the white cream. At first I thought I might add the juice of the pomegranate which I'd reserved for decorating, but I was afraid that the extra liquid would screw up the texture of the ice-cream. I think it's a good idea to label anything that goes into the freezer, lest it gets lost in the icy depths, never to be found again. The verdict? Fabulous! We ate the ice-cream the next day, and it had a lovely creamy texture - so easily scoopable, even straight out of the freezer! It looks so pretty as a single scoop in a small bowl. The only problem was that in my haste, I used bottled lime juice instead of fresh, and the slightly artificial taste of the juice came through in the final product. Not to worry, my parents loved it, and I'll definitely be trying this one again! That looks gorgeous, love the step-by-step pix :) Did you try any of the unfrozen cream? Heavenly! Oh gosh, that ice cream truly is heavenly. Yum!